Bosnia and Herzegovina during 1993 at the time of the heaviest fighting between the two warring sides. 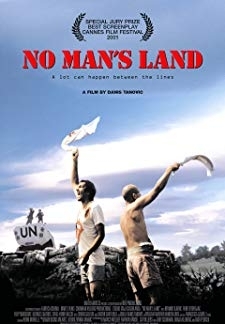 Two soldiers from opposing sides in the conflict, Nino and Ciki, become trapped in no mans land, whilst a third soldier becomes a living booby trap. © 2018 Scratchu.com No Mans Land | Branko Djuric, Rene Bitorajac, Filip Sovagovic, Georges Siatidis, Serge-Henri Valcke, Sacha Kremer, Alain Eloy, Mustafa Nadarevic, Bogdan Diklic, Simon Callow, Katrin Cartlidge, Tanja Ribic, Branko Zavrsan, Djuro Utjesanovic, Mirza Tanovic - No Mans Land (2001) | Bosnian Movie | 8.0/10 | Synopsis : Bosnia and Herzegovina during 1993 at the time of the heaviest fighting between the two warring sides. Two soldiers from opposing sides in the conflict, Nino and Ciki, become trapped in no mans land, whilst a third soldier becomes a living booby trap.... Watch Online!! !